Welcome back Laundry-ites! This is going to be a great idea for your little ones to really experience the Easter story along with you. Before I start this how-to, I want to let you know about two resources I’ve found recently which, I think, will really be up your street. 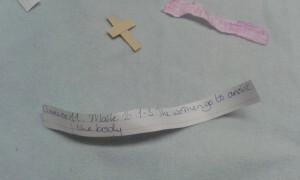 The first is a resource for Easter by ‘OhAmanda.com’ called “A Sense of the Resurrection”. I’ve just downloaded it and am very impressed by the concept. It’s 12 activities which can be used as Easter approaches. Possibly slightly too much all to be done in Holy Week but great for those of us who have only just caught up with the fact it’s Lent! I have friends who used it last year and loved it. Probably for the 3-10 crowd looking at it but really designed for the whole family. Definitely worth checking out! Also, a lovely online magazine called Home Front. They call it a spiritual parenting resource. Imagine the kind of ideas I share here crossed with Country Living Magazine and you’ve got the idea. It’s beautiful, usable, a bit of fun too and FREE! (My favourite price). I haven’t read more than a couple of editions but I like what I see. Right, to the main event! So, what are Resurrection Eggs? 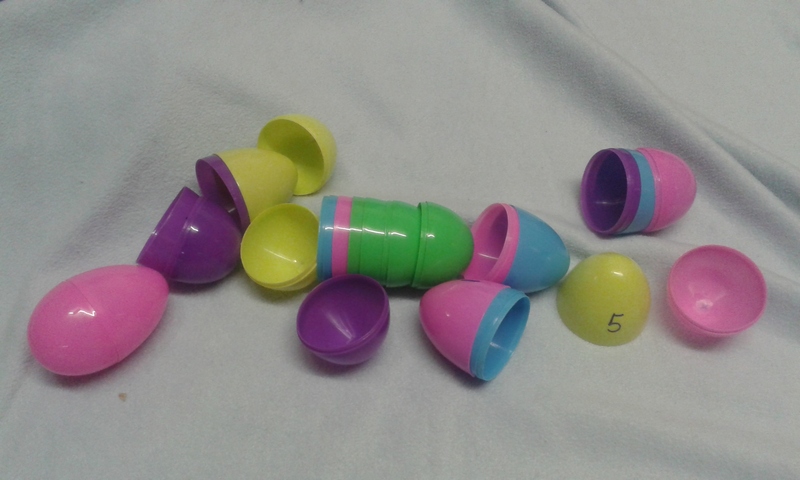 Basically, they’re a dozen plastic, hollow eggs into which you put symbols representing different parts of the Easter story. It’s an engaging and tactile way to tell the Easter story again and to help children order what happened in their minds. Anything with a ‘reveal’ helps to hold their attention, as does the fact that they can use their fingers and noses as well as their eyes and ears to experience this story. You can use them in different ways depending on your kids but what we did last year was to start by getting them out a few times and opening first one, then two the next day, then three, always building up the learning. By day 5, Pigwig got impatient with that (where’d she get those genes? Erhem!) so we took them along on Easter day to my parents’ house. It was raining so no garden egg hunt but I hid them around the living room and, once assembled, we opened them one by one to tell the story together, Mummy filling in the bits the children didn’t yet know. And yes, of course, I gave them chocolate eggs to eat as a prize for finding the plastic eggs (and this shockingly addictive stuff!)! You can buy a whole set at Amazon with a little accompanying story book but the book isn’t that great (I’ve seen a set) and they’re a cinch to make, costing less than a quarter of what the bought ones do. Crack on, use things you have around the house, and you’ll be done in under an hour. This idea is good for age 4 and up but, for toddlers, this version is even easier to do and more appropriate. 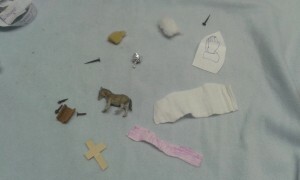 A small plastic donkey (you could use a picture) or palm leaf – Playmobil pot plant pieces maybe? A real fern leaf would work if not left too long. a purple cloth – as above but I used purple felt tip to colour it! 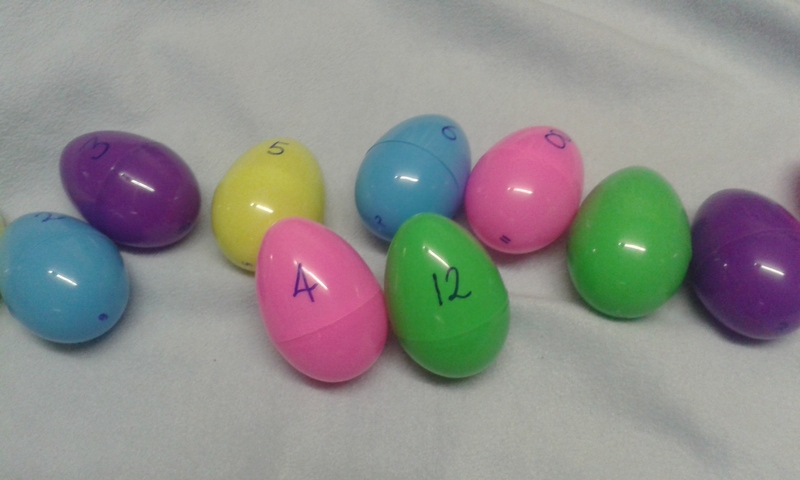 Write out the reading plan below onto some paper and cut it into strips to tuck into each egg. Or, you know, print it. Our printer is always either broken or out of ink. I also added a quick summary of each story as I couldn’t flick through my bible, or even a children’s bible fast enough to keep the kid’s attention through several eggs. If you were doing one egg a day, you might have a chance. You might also be able to come up with a plan using a favourite children’s bible, maybe using fewer eggs. Your choice. Number the eggs, a large number on the pointy end for the kids to read and a small number at the bottom. This is so the right top ends up back with the right objects which nestle in the egg bottom. Day 12: John 20:1-8. The final egg is empty! This was easy! Assemble your eggs and see how your children respond. I’d love to know how you get on and what variations you create! With thanks to The Vicar’s Wife for the inspiration to just get on and do it last year! Awesome, Cat! Look forward to seeing pics! This is great Jen – I made 2 sets to give to godchildren and 1 for us. We used it yesterday and today with cousins who were visiting and it really captivated them, from age 2 up to 9. Think the bible verse for #9 needs amending though – just a typo I’m sure but it’s not the bit with the sponge which I think it should be!